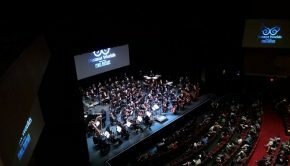 I recently attended the Durham, North Carolina performance of The Legend of Zelda: Symphony of the Goddesses. This was not only my first time hearing any part of this performance set, but my first time ever attending a live orchestral performance of video game music. As such, my expectations were high, and Symphony of the Goddesses delivered on many of my hopes. Although the performance did have a few low points, the quality of the music and its many moments of real beauty made the experience well worth my time. A full concert program is available here. This particular concert tour is somewhat unique in that every piece of music is performed in strict time with pre-packaged game footage. While this added a sense of cinematic drama and interest to the performance, it also meant that the music couldn’t ebb or flow to match the audience’s energy, and it gave some of the performances a slightly canned feeling. For example, performance tempos were often uncomfortably uniform, no doubt to make timing easier with the video. Dynamic levels were also fairly uniform, probably to match the energy of the game footage as well. With the music being so closely matched to visuals, this performance seemed to have an imbalance of higher and lower-energy selections. Almost every piece was fast, dramatic and loud, with only a few brief interludes of the more melodic and internal themes that work so well in the Zelda franchise. I personally would have been glad to trade one or two of these arrangements for a few character-oriented selections instead. At times it felt as if the program tried too hard to fit ‘everything’ into the performance. For instance, nearly every Zelda overworld theme made an appearance, with several appearing multiple times. 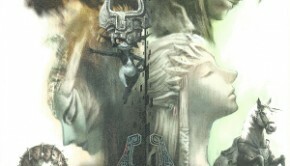 The performance also had a distinct surplus of Ganondorf battle themes. This was problematic a) since so many of them sound similar, and b) because many Ganondorf battles also look so similar, and footage of these battles inevitably accompanied the music. As mentioned before, the almost-constant game footage does give this program some visual interest, and does heighten the storyline behind each piece. Still, I actually found myself getting bored once or twice. It wasn’t that the music lacked quality. It just lacked contrast. Too many arrangements on the program were a bit too much alike. Critical as this all sounds, though, the performance’s moments of musical genius handily compensated for its shortcomings. The concert tour recently added a full section devoted to The Legend of Zelda: Breath of the Wild. This was one of the best selections of the night. 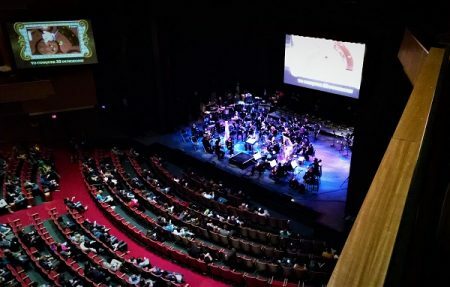 Not only was it musically distinct from previous Zelda soundtracks—giving the concert some much-needed variety—but this selection lent itself particularly well to full orchestration and live performance. 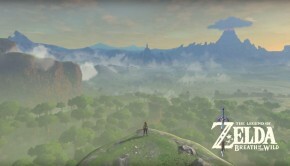 The main theme from Breath of the Wild was especially exciting in-person, although the game footage played with it looked, unfortunately, identical to the long game trailer set to this same theme a year ago. Another highlight of the night was the short selection from Majora’s Mask. This is a uniquely eerie entry in the Zelda series, but it is also the single Zelda game with the most fleshed-out and vibrant cast of characters. As such, it was rewarding to hear more of this game’s lyric and emotional tracks, like the “Song of Healing” which opened the set. Hearing this live made the concert worthwhile almost in and of itself. The selections from Link to the Past were also particularly interesting. 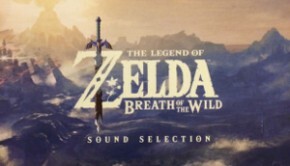 Although many of the Zelda series’ most iconic themes first appear in this game, the Link to the Past arrangement focused, surprisingly, on some of the less well-known themes, like the game’s epilogue music. The orchestra performed this arrangement particularly well, with a wider expressive range and cleaner transitions between sections. This arrangement also felt especially well-rounded, combining grand themes like “The Dark World” with mellower ones as well. From the concert’s beginning, opening with a medley of main themes, the orchestrations were excellent. Most arrangements added many layers of instrumentation while still sounding similar in texture to the source material. The arrangements also felt natural for the instruments chosen, highlighting brass, percussion, woodwinds, strings, and the live chorus in fairly equal measure. Individual performances were also excellent, with fantastic solos on the trumpet, violin, flute and English horn, and very polished ensemble across the orchestra and chorus. One of the most rewarding things about attending this concert was the energy of the audience, which made up in many ways for the rigidity of tempos and dynamics. The performance venue’s 2700 seats were full, with older adults, college students, teenagers and quite a few children there together. 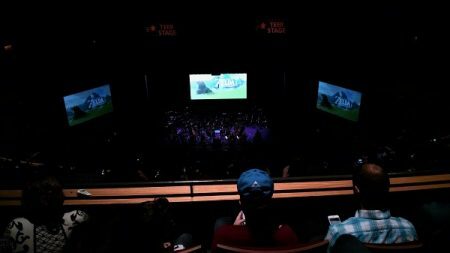 What’s more, a huge chunk of the audience came in cosplay or Zelda franchise apparel, which ramped up the sense of audience enthusiasm and shared fandom. This sort of audience response made the evening rewarding even before the music began. I’ve never seen audience reactions like this for an evening of Mahler, Sibelius, Schubert or Beethoven. Despite my reservations about repeated themes and rigid tempos, this concert offered professional-quality performances—comparable to those of the finest orchestras in the Raleigh-Durham region—and a very satisfying range of musical material. It’s impressive that this concert captured as many themes as it did, given the huge scope of the Zelda franchise. For old and new fans alike, this concert tour makes a great setting to hear your favorite Legend of Zelda themes. And for me, it was a great introduction to orchestral performances of video game music. Posted on January 20, 2018 by Stephen Taylor. Last modified on January 20, 2018. Stephen Taylor A violinist with the Raleigh Symphony Orchestra, his dream job is to conduct his own orchestra, teach college-level writing, write novels, and walk around outside all day--but since this job doesn't exist, he's a graduate student instead. As an undergraduate he studied music and English at Southern Virginia University.